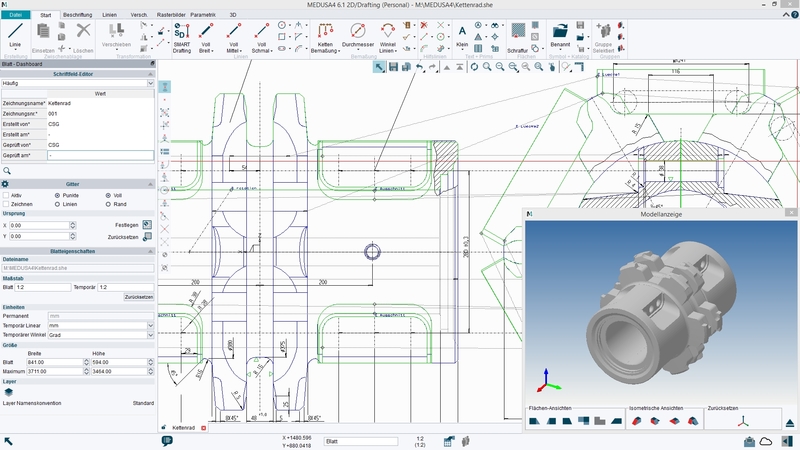 The free MEDUSA4 Personal CAD software is part of the MEDUSA4 family of CAD solutions. Its extensive design functionality, similar to the most advanced commercial package, includes basic 3D, parametrics, colour image integration and sheet metal design. The free download is available in English, German, French, Italian and Japanese. Sheets carry a"not for commercal use" watermark (which can be removed via the eSERVICES pay-per-result portal for commercial users).Private, non-commercial use, and the deployment of the software for educational and research purposes is completely free of charge. Businesses do not have to pay for the software, only for commercially viable results. Companies wishing to use the software commercially can do so on a pay-per-result basis. The CSG eSERVICES portal unlocks MEDUSA4 Personal drawings for unlimited commercial use.